The Center for Discovery is marking World Autism Awareness Day with a renewed push in both New York and national media to highlight The Center’s groundbreaking approach to care and research that’s transforming the lives of adults and children with autism spectrum disorder and other complex conditions. 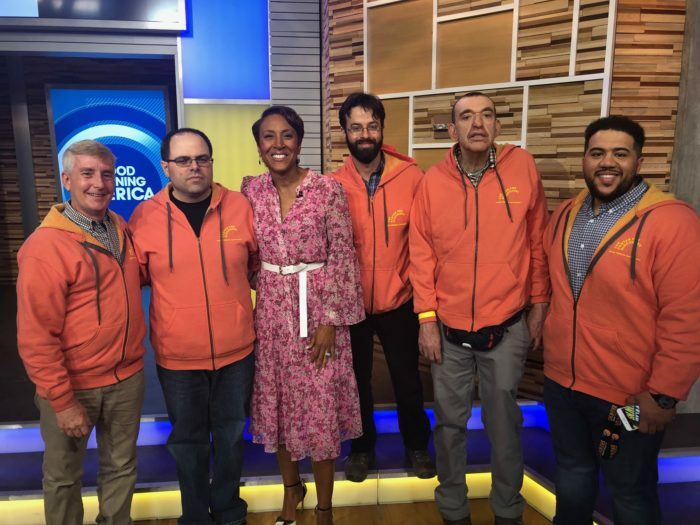 A small delegation from The Center, including residents and staff made the early morning trip Tuesday from Hurleyville to Times Square, in their distinctive orange sweatshirts, to be in the audience of ABC’s Good Morning America. 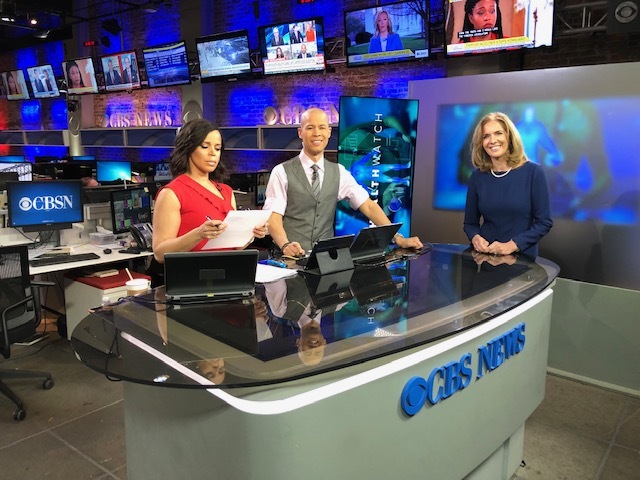 A few blocks away, TCFD’s Associate Executive Director Dr. Terry Hamlin was on CBSN, which is the national 24-hour streaming news network of CBS News. And at the weekend, Dr. Hamlin and Executive V.P. 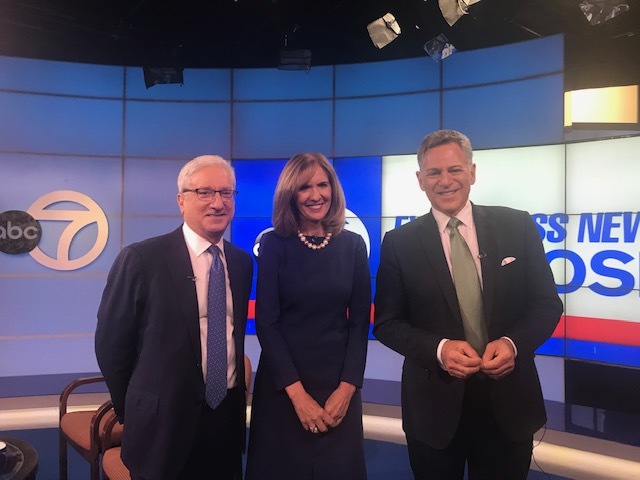 of Marketing and Strategic Communications, Michael Rosen, appeared on ABC7NY’s Up Close with Bill Ritter to discuss some of the latest research into ASD. According to estimates by the Centers for Disease Control and Prevention (CDC) approximately 1 in 59 children has ASD. Dr. Hamlin says it’s still unclear as to why. On this day, she has suggested advancing the conversation beyond “autism awareness” to “autism intelligence.” “We have to understand what’s happening in the environment. What’s happening from a genetic standpoint,” Dr. Hamlin said. “There are a lot of people in the field right now but everybody is in silos…We have so much information but so little understanding.” Dr. Hamlin emphasized the importance of working together and sharing information. She also revealed some significant new findings about the possible reasons behind some cases of elopement, which according to a recent study, affects nearly fifty percent of children with autism and can put them at extreme risk. Dr. Hamlin says based on the data TCFD researchers have gathered about several children at The Center, it’s possible that the need to wander off may be less about a desire to run away or toward something, and more about biological issues, like gastrointestinal problems that are causing pain and stress. Dr. Hamlin stressed that more information is needed to see if this has an impact on other children. Rosen spoken of his personal experience with his son Nicky, who has autism, and would often bolt from his home and end up in extremely dangerous situations. Rosen, like many parents, resorted to locking Nicky in his room to keep him safe. Once at The Center, Nicky’s underlying GI issues were addressed as a part of his daily lifestyle and he began thriving with the help of a safe and secure environment. Now he’s living in a house on Main Street, Hurleyville, with five of his peers, and engaged in a meaningful life. Together leading architects, tech experts, and healthcare professionals, along with families, community leaders, and policy makers are exploring the science and research behind designing safe and healing environments for those with autism and other complex conditions. We have over 1,600 employees, many of whom started their careers with us and are now expert farmers, whole-food chefs, teachers, clinicians, doctors, and celebrated leaders. Our growing reputation for excellence has attracted talented staff from all over the world. The possibilities here are limitless - join our team today. Designated as a Center of Excellence in New York State, we have become a magnet institution where individuals from around the region and world travel to receive highly advanced care and access to groundbreaking research for a myriad of complex conditions. We offer residential, medical, clinical, and special education programs to over 1,200 children, adults and families annually. Copyright © 2019. The Center for Discovery, Inc.